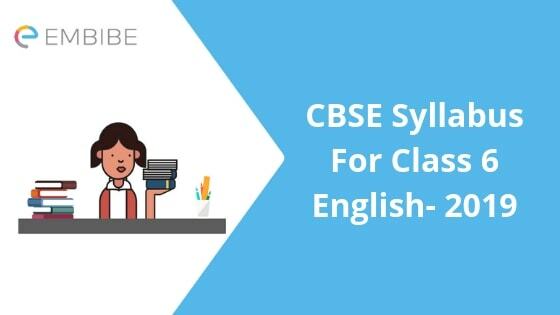 CBSE Syllabus for Class 6 English 2019 | Central Board of Secondary education (CBSE) has a headquarter established in Delhi. With the affiliation of more than 17000 institutes from all over India, the CBSE Syllabus is accepted nationwide into the affiliated institutes. Among the major subjects of CBSE, English is the topmost important subject. The syllabus of English subject for CBSE is approved by the National Council of Educational Research and Training (NCERT). The English syllabus of Class 6 is divided into 3 main sections. Whereas the First section is English Grammar, Second is Applied Grammar and the 3rd section is the written section. During the curriculum, students usually go through concepts like Noun, Pronoun, Sentences and Phrases, Dialogue Completion, Sentence Transformer, Letter writing, Debate, Speech etc. The CBSE Syllabus for Class 6 English mainly includes 3 sections as major. Grammar, Applied Grammar and Writing Section. The purpose of the subject is to improve the skills of the student by making them familiar with the basic important concepts. The syllabus for Class 6 English focuses on improving the communicating and the writing skills of the students. To gain excellence in a subject, it is mandatory to be familiar with each and every basic concept first. The CBSE Syllabus for Class 6 English was designed for the same purpose. The syllabus includes the basic knowledge of the language so that the foundation is set strong for future requirements. The subject includes important topics like Noun, Pronoun etc. The topics like letter writing and application writing are a part which will be useful for formal purposes in the future. Further, we are discussing the section wise topics for your reference. 1- English Grammar- This section of the subject focuses on the improvement of language skills. It trains the students for the basic concepts like the use of verbs, adjectives, helping verbs, pronouns, nouns etc. The section also trains the students to frame proper sentences so that they can easily communicate by using the second most spoken language in the world. 2- Applied Grammar- This section is designed considering the uses of the English language in real life. The section includes the parts which can be helpful in developing good oral communication skills. Sections like Gap filling improves the decision-making skills of the students when it comes to framing a sentence. Editing section of the applied grammar helps the students in contradicting the wrong statements or the language formation with the right ones. It improves the judgemental power when it comes about grammar and all. 3- Writing Section- The third but most important section is very useful for language skill development. Students involve themselves in various activities like Formal letter writing, Message writing etc. This part doesn’t only help them to improve the writing skills, but it also helps in building a base for professional development. As discussed above, the CBSE Syllabus for Class 6 English is an important part of the study. It is mandatory for the students to be prepared at this level of education so that the base can be strong for the future. We hope that our article on CBSE Syllabus for Class English was useful for you. If you have any query or feedback to share, please feel free to drop a comment below. We will get back to you within a very short time. In the end, we wish you all the very best for your future exams on behalf of the whole team of Embibe.